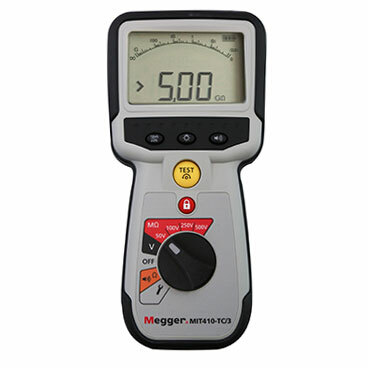 The Megger MIT410-TC/3 insulation resistance and continuity tester has been designed specifically for use within the telecommunications industry. Unique telecommunicationsrelated features include a soft canvas carrying bag with shoulder strap and rugged snap hook to attach to a tool belt, and a “bed of nails” test lead set. The instrument allows the user to determine the condition of the insulation of the twisted copper cable pair, which could cause problems for services such as voice, video, and data or VoIP. When the insulation becomes weak or brittle, causing cracks or exposing copper within the cable, or water ingresses into the cable, the insulation resistance test will identify these situations immediately. Replacing the original MIT410TC/2 instrument, the new unit features a redesigned case, back-stand, and 6 cell battery compartment with separate fuse access. All instruments are over-moulded for increased protection and continue to achieve an IP54 weatherproof rating.